Claudio lives in Curitiba, Southern Brazil and has been working with urban poor, young people and communities for 25 years. 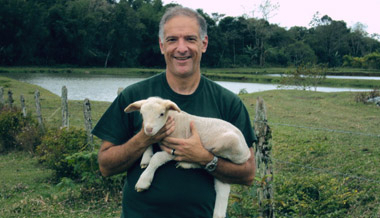 In 2011, Claudio and others launced an International Learning Community based on spirituality, organic farming, dialogue and mentoring on a small farm. Claudio Oliver invites us to consider eternal Friendship trips over the traditional mission trips. If you lost everything, how long would it take you to get something to eat, find a place to stay, and a get some work? Claudio Oliver asks the question, "Do you have a mission or does the mission have you?" Is our ministry too focused on "empowering" people? As pastors, are we spending too much time "running the business" instead of feeding sheep to feed others? Claudio Oliver on Jesus marrying a pregnant bride.